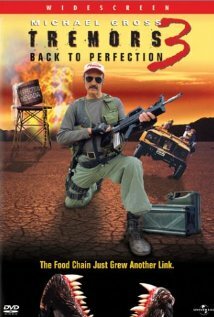 Tremors III: B ack to Perfection is the movie that heats up the Tremors series as Burt returns to Perfection in this film. While Burt is there, he finds himself face to face with even more monsters to deal with. The monsters transform yet again into a third form that is even more frightening and deadly than the first two forms. Watch this thrilling film this year with friends and family. Just keep in mind that children should never watch this movie alone. Will Burt be able to save Perfection as well as those who live there? You will just have to wait and see. To learn more, you need to go to http://www.imdb.com/title/tt0259685/?ref_=sr_3. This movie gets a five out of five popcorns rating.